Did population density create modern humans? 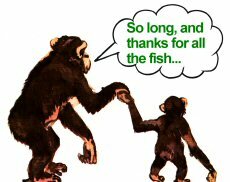 Global Warming Behind Early Primate Diaspora? What prompted early primates to travel between continents 55 million years ago has perplexed scientists for years. Could rapid global warming have been the driving force? Humans Behind Early Oz Ecosystem Collapse?